Late pickup, stroppy minivan driver followed by rivers of flood water - That was our journey to Sihanoukville in a nut shell. We’d arranged a hotel pickup by the bus company at 6:15am which would give us plenty of time to get there, get bus tickets printed, pick up some breakfast and leave on the 7am minivan. At 6:25 we’re getting worried and ask the lobby to ring the company, some weak and wobbly excuses later plus another phone call at around 6:45 the minivan arrives to pick us up. As Paul sorts tickets I run off to the shop and grab some sandwiches and I get back just as they are saying we’re off, so I take my place in the front seat that I’d booked specifically online. The driver (this is the same one that was late to get us, shouted at me for running to the shop and generally lacked any social grace) then yanks open my door and says I must move to the back. I declined and said ‘no this was the seat I booked’, to which he grumbled an ok and shut the door. The next 6 hrs were relatively uneventful, although the constant fast, break, swerve of Cambodian driving can leave even the best travellers feeling queasy. We arrived in Sihanoukville, or Skankyville as I call it, in the middle of another tropical downpour and from the state of the roads, which closer resembled rivers, it had been raining for some time. Skankyville is literally a huge building site, there are casinos and posh hotels going up left right and centre and the completed structures in-between look like they are in need of demolition, I was very glad we were just getting a transfer straight to Koh Rong island. 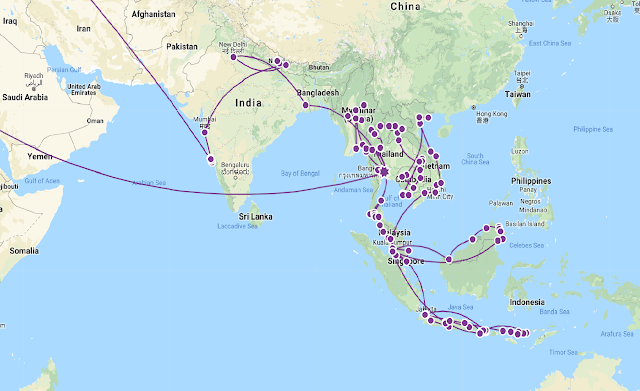 We’d booked the ferry ticket and bus ticket as a combined package with Mekong Express for about $32 each, using the speedboat company GTVC and upon arriving at their office we were ushered onto a waiting minivan to be driven to the boat. Turned out that the weather had been so bad they were using the second port which is about 20mins away, thankfully we were just in time for the transfer van. The speedboat crossing took over an hour to get to Koh Rong, as it stops at Koh Rong Sanloem first and the crossing was rough, I was outside but had to hold on for dear life as the boat was lifted and then dropped by the massive waves. 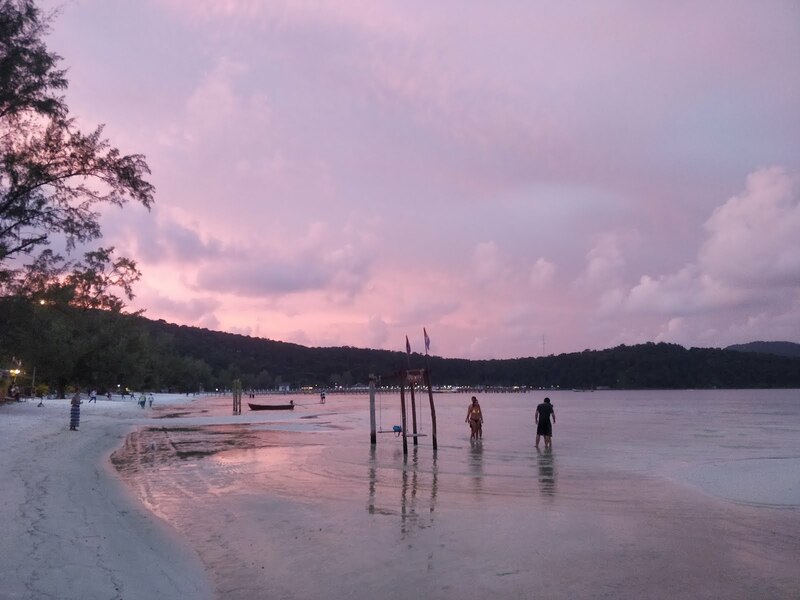 Our accommodation for the first 2 nights was located on Long Set beach, which is a special stop that you have to request from the boat crew and is a quiet secluded stretch of white sand. 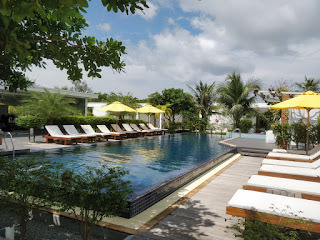 Long Set Resort was totally out of our normal budget, but it was only for 2 nights and did look wonderful. 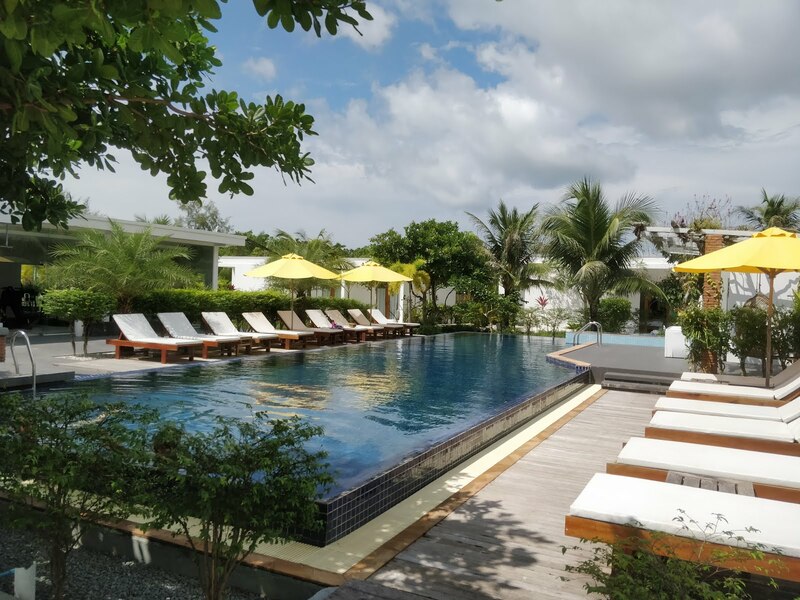 White modern bungalow blocks were set back from a private section of the beach and the grounds included with a pool, gym (hahahahaha), mini mart, bar and restaurant. Having fallen for the beaches of Indonesia I honestly wasn’t expecting much from these, but I’d booked it because I’d heard you can see bioluminescent plankton in the waters around these islands. The beach however was stunning and would give any Indonesian beach a run for its money any day. We had a wonderful couple of days doing nothing but sadly we didn’t see any glowing plankton. We had heavy rain both nights and whilst I went for a wander along the shore one night I didn’t venture in the water and the lights from all the resorts stay on all night so there is a lot of light pollution. 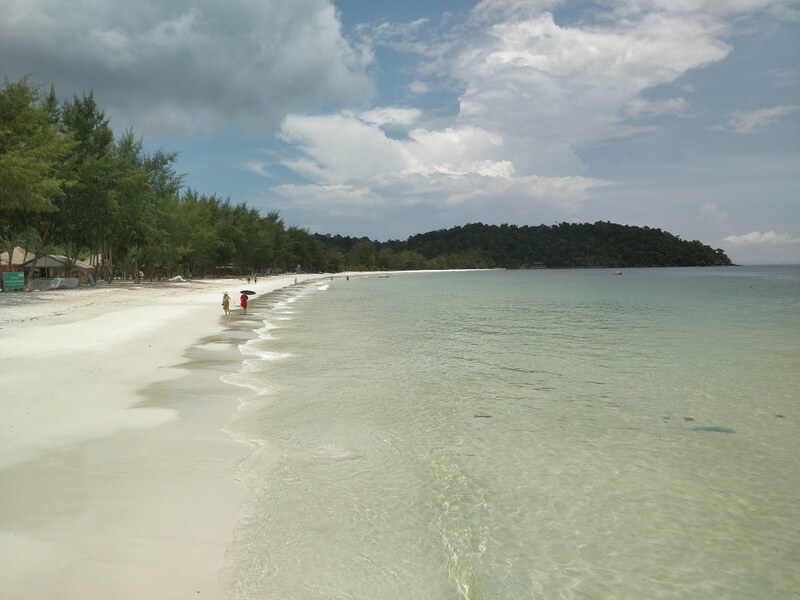 Our second stay was the neighbouring island of Koh Rong Sanloem which is a slightly smaller and this time we’d opted to stay on a busier section of beach called Saracen Bay. 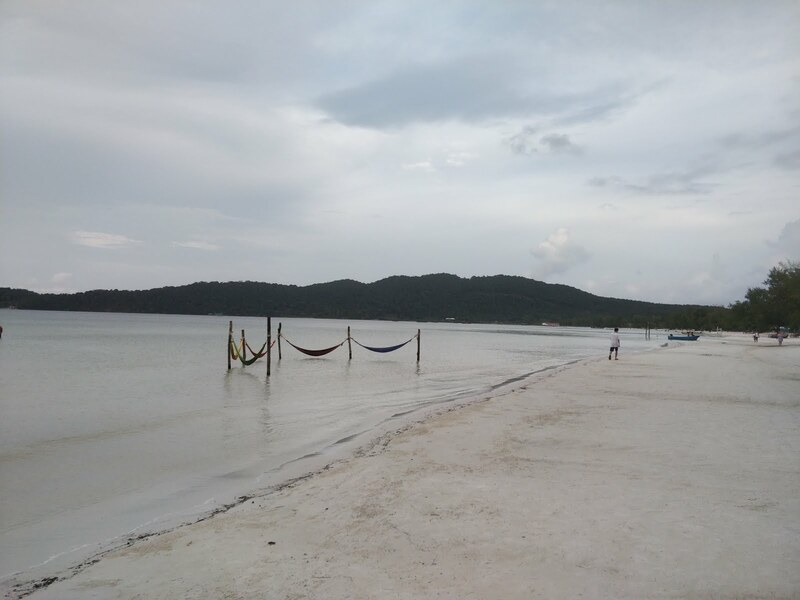 It was another beautiful white stretch of sand dotted with palm trees and beach bars. We hadn’t realised that you are supposed to notify your resort with your arrival time, so they can come and get you in the resort boat. 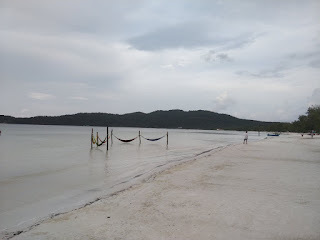 As we hadn’t informed the Sara Resort when we would be there we were dropped off right at the top of the beach and had to walk 10mins to get to it, tbh it was an easy walk and at least it gave us a chance to see the happy hour and other reports along the way. The Sara Resort is advertised as quite new and they certainly seemed smarter than some of the others we went passed. They had a large bar / restaurant on the beach then loads of little detached bungalows on stilts leading away from the beach and then a newer block of smaller terraced rooms furthest back, one of which was ours. We settled in with our free welcome beer and then went for a wander up the beach a bit. We noticed that they had a lot of tours advertising that you can swim with the plankton for $10 and were thinking of booking it when I heard that you could also see it directly from the beach if you swam out far enough. That seemed like the best deal and we then settled down to wait until midnight when hopefully the beach bars would turn off their lights. As per normal we worked our way through a few beers and buckets of cocktails before heading to bed to wait for midnight. I set an alarm just in case I dosed off but was too excited to sleep and come 12:30 I headed off on my own as Paul decided he would rather stay in his cosy bed. The beach was quiet and although a few resorts had lights on it was much dimmer than it had been, judging by the voices a couple of other people were out in the water and so I just started walking out towards them into the blackness. I didn't see anything at first but when I got to about chest high I could suddenly see all these tiny bright blue lights in the water when I moved by hands through it, it was totally amazing! I was then leapt on by a big dog that decided he was too tired to swim and wanted to sit in my arms for a bit! A totally surreal experience and I decided Paul needed to see, so I carried the dog back to the beach, where he promptly ran off and I went to get Paul. I think Paul had started to fall asleep but when I burst through the door gibbering away about galaxies of underwater stars and huge dogs that didn’t want to swim, bless him he put his shorts on and followed me back to the beach. Words can’t really describe it. Every time you moved the water a burst of tiny electric blue lights would swirl around you and light up for a few seconds, then it would fade to black. These tiny lights were too delicate to be picked up by a camera and it was hard to see the ones created by other people standing next to you, so it was like you had your own personal light show that you had to take in and remember because there’d be no footage to remind you of it. Such an amazing experience. The following day after more lounging around reading we decided to book one of the $10 night cruises as hopefully they would take you to a darker place around the island. We booked through the bar next door called the Tree Bar and were told to come back at 6:30pm as the boat would go at 6:45pm. Unfortunately, this trip was a bit of a let-down when compared with what you can see at midnight off the beach. The boat only takes you a bit further out in the same bay, so you always have the bright shore lights not far away in the distance, then there are a few houses around the edge which have their own bright outdoor lights, plus loads of fishing boats. We did jump in at a fairly dark bit and the bioluminescence was again amazing but it was no better than it had been the night before. The only difference with this trip was we had snorkel and mask and looking down in to the dark water with these swirling lights was so other worldly, it took your breath away. I’m so glad we decided to spend a few days on these islands as they really were something special, but sadly that was our last night and the following morning we would be off to Kampot for some Cambodian Cider!